”Scientists have taught dolphins to combine both rhythm and vocalisations to produce music, resulting in an extremely high-pitched, short version of the Batman theme song. The findings, outlined in two studies, are the first time that nonhuman mammals have demonstrated they can recognise rhythms and reproduce them vocally. “Humans are sensitive to rhythms embedded in sequences of sounds, but we typically consider this skill to be part of processing for language and music, cognitive domains that we consider to be uniquely human,” says Professor Heidi Harley, lead author of both studies. The studies will be presented at the joint meeting of the Acoustical Society of America and NOISE-CON 2005, which runs from 17 to 21 October in Minneapolis. Harley, who is associate professor of social sciences at the New College of Florida in Sarasota, says that both studies tested dolphins at Disney’s Epcot Center in Florida. The researchers first had an adult male bottlenose dolphin position itself in front of an underwater sound projector, called a hydrophone, that produced six different 14 kiloherz, 4 second rhythms. 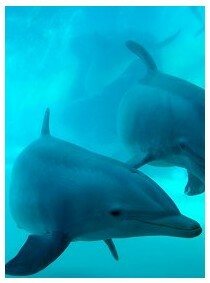 The dolphin was rewarded for performing a certain behaviour to each rhythm. For example, when rhythm 1 played, it waved its pectoral fin and when rhythm 2 played, it tossed a ball. The various rhythms were played at different frequencies and tempos to ensure the dolphin was recognising rhythms instead of just frequencies or sound durations. Another adult male was trained to produce similar rhythms using a pneumatic switch, essentially a small, air-filled ball connected to a computer that then generated sounds whenever the dolphin pressed the switch. “The dolphin was reinforced for producing a specific rhythm to a specific object,” says Harley. “If you recall the original Batman TV series musical intro you’ll probably remember the way they sang ‘Bat-maaaaaaaan’,” she adds. The dolphin spontaneously vocalised to the rhythms, so the researchers started to reward the male with fish whenever it matched its ‘singing’ to the rhythms. By the end of the studies, the scientists could show an object, such as the Batman doll, which represented a certain rhythm-vocalisation combo to the dolphin, and it would create the correct sounds both vocally and using the switch. But Bauer doubts that dolphins realise they are producing what people consider ‘music’. Harley agrees, and hopes the everyday vocalisations of dolphins will be analysed in terms of their rhythmic content. In the near future, she and her team are planning to test the dolphins on their ability to recognise recordings of their own rhythms by having them associate their own sound creations with identifying objects similar to the Batman doll. The news was mentioned in several other publications in October, but I could nowhere find a sound clip of a dolphin singing the Batman-tune. I have not given up yet, that is why I write this: if you happen to have a recording of that dolping singing Batman , or of any other animal singing any other tune, please let me know. Here is the best musical animal performance: a parrot that was owned by an opera singer. This recording, which showed up on a Spiral-tape is probably made in the 50’s. More about the Spiral-tapes later on in this Soundtrack! And here is a recording from 1955 of a dolphin named Peter who was given talking lessons. Maybe, if you are very drunk, you can recognise a word, but I could not. Excellent article! I was fascinated with this parrot singing opera, would like to use it at my blog perhaps. Do you have any more info on it? What opera singer might it be, and what on earth is a “Spiral-tape”? thanks for your comment on the singing dolphins & parrot story! Spiral tapes was the name of a series of spoken word cassettes that were released by a friend of Willem de Ridder. Stuff from all corners of the world. There were usually not much liner notes with the recordings. So, i can tell you nothing more about the singing parrot than i already did. Can you send mea link to your blog? Hi, and thank’s for replying! I haven’t written the post yet though. I was getting into the theme of what rythm and musicality might be all about. It’s a strange phenomena after all. It would have been a nice touch if the singer were Luisa Tetrazzini, !http://image.http://tbn0.google.com/hosted/images/c?q=55f21bf3447ea2b9_landing! , but I guess we’ll never know. I’ll research some more about Spiral Tapes and Ridder and see if I come up with something.